Princess Diana’s wardrobe boasted so many amazing pieces from some of the world’s most respected designers. There was the midnight blue Victor Edelstein dress she wore to meet the Reagans in the States and the figure-hugging Christina Stambolian number she donned for a Serpentine Gallery summer party. And how could we forget the show-stopping burgundy velvet gown she stepped out wearing at the Steel Magnolias premiere in 1990? It was simply stunning. Just a year after the screening, Diana slipped on a sensational beaded Versace creation for a shoot with photographer Patrick Demarchelier. Pale silk and embellished with gold studs and pyramids plus multi-faceted glass in shades including aqua marine and sparling white, it’s a design that really is hard to forget. Love it as much as we do? Now’s your chance to add it to your own closet. The exquisite piece – which is thought to be the first dress Donatella’s brother Gianni Versace crafted for Diana – is going up for auction on 27 June…with an eye-watering minimum price tag. Bidders will be invited to place offers starting at $ 30,000, but it has already been estimated that it will sell for between $ 60,000 – $ 80,000. Diana’s Versace floor-sweeping maxi is being sold on by Julien’s Auctions, a company based in Beverly Hills that specialises in selling items from some biggest stars in history including Marilyn Monroe and The Beatles. And it’s not the first time the dress has been in the public eye since the death of Prince William and Harry’s mum in Paris on 31 August 1997. 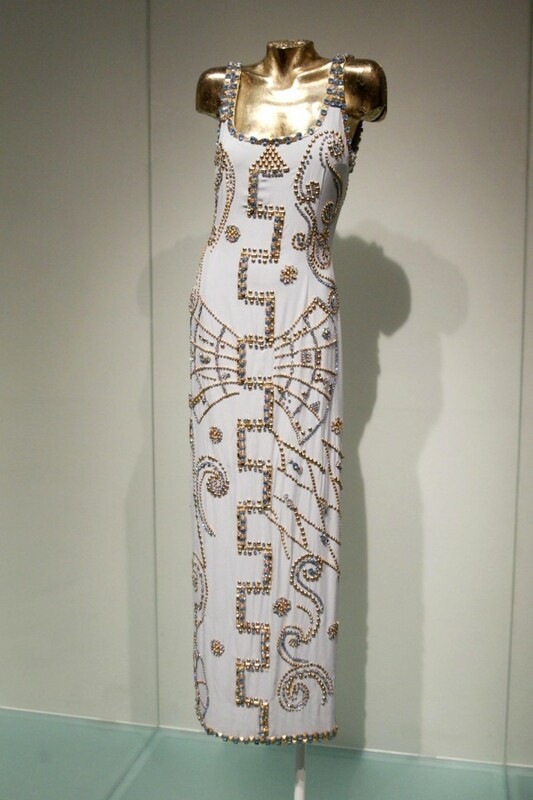 It was displayed at the the Versace exhibition at London’s Victoria & Albert Museum back in 2002. The event celebrated the career of Gianni from 1946 – 1997. For more on Princess Diana, come with us as we analyse the truth behind her most famous fashion moments.